In wastewater treatment the most common uses include the suspension of micro-organisms, the dispersion of oxygen, the mixing of different streams (eg. influent and RAS) and the blending of chemicals (eg. flocculation). Many types of mixers are available and they should be selected, sized and positioned according to the required task, the tank geometry including any flow impediments, the tank retention time, the characteristics of the wastewater and accessibility constraints. Intelligent selection is an important part of optimising the treatment process and reducing investment and operating costs. Mixer performance is still all too commonly compared on the basis of Power Density (W/m3) and Thrust (N). Both of these are poor measures of mixing performance and as such have limited use. Where no settlement is required a comparison of Minimum Bottom Flow Velocity (m/s) is imperative, and where no dead zones or short-circuiting (ie. optimum retention) is required then CFD modelling backed up by dye testing after commissioning is recommended. Another useful and low cost test for homogeneity in activated sludge processes is where Mixed Liquor Suspended Solids (MLSS) are sampled at different locations and depths and concentrations compared. We highly recommend in-situ testing after commissioning. This protects you from spurious performance claims and ensures optimum treatment performance. HyperClassic Mixers have a vertical shaft, and large hyperboloid impeller positioned close to the tank floor. These mixers are unique in both design and performance. No other mixer in its class can rival its mixing characteristics and energy efficiency. CyberFlow Flow Accelerators are innovatively designed flow accelerators. Their large diameter ‘banana’ blades and CFD-optimised design make them the most energy-efficient flow accelerator available for oxidation ditches and other horizontal flow configurations. 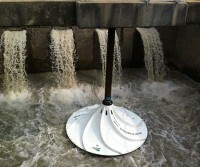 Landox Flow Inducers have a vertical shaft with large vanes – rather like a vertical paddle wheel. 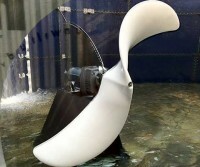 This large impeller is driven at low speed by a motor and gearbox above the water line. They are best positioned on the internal bends of oxidation ditches or carousels and a strong horizontal flow is induced by vertical slow rotation of the vanes. Submersible Mixers are usually guide-rail mounted and commonly used for blending and suspension. Directly-driven high-speed units with compact propellers are used for smaller volumes and higher viscosity liquids, whilst gear-driven low-speed units with larger propellers are used for larger tank volumes where energy efficiency is more important. Spiral Mixers are surface-mounted for convenient installation and maintenance. The motor is mounted above the water line and drives a diagonally-pointing, ‘anti-rag’ helicoid impeller. 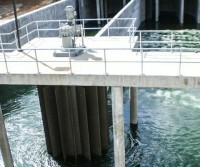 They can be bracket-mounted to a bridge or tank wall, or float-mounted where water levels fluctuate. They are very similar to Spiral Aerators without the aeration capability.